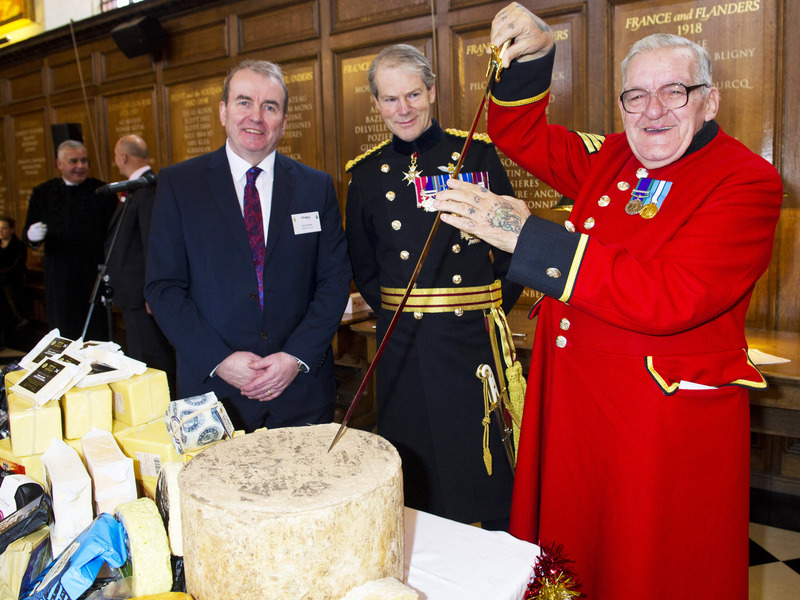 London, 6th December 2018 – The Chelsea Pensioners and Dairy UK today kicked off festive celebrations with the annual Ceremony of the Christmas Cheeses, with Dairy UK announcing innovative plans to champion the taste and nutrition of cheese. The Chelsea Pensioners today joined the annual Ceremony of the Christmas Cheeses, to which British cheesemakers donated over 270kg of the finest cheeses from around the UK. Donations included cheddar, stilton, brie and red Leicester, with this year’s ceremonial cheese a giant 24kg of Montgomery Cheddar, donated by J A E Montgomery Ltd.
With 2018 marking the centenary of the Armistice, tribute was paid to the brave men and women who have given their lives in conflict, and those who have fought in every conflict since WW1 to ensure our freedom, with Mr Vernon highlighting the historic role cheddar rations played in providing important nutrients to soldiers. The traditional cutting of the ceremonial cheese was carried out this year by Chelsea Pensioner Alan Goddard. Alan enlisted at Southampton on the 13th March 1961, joining the Grenadier Guards and serving with the 2nd Battalion before retiring in 1983. Alan saw service in Hong Kong, Belize, British Guyana and completed four separate tours of Northern Ireland. He finished his career with a UN tour in Cyprus and was discharged in 1983, having been promoted to the rank of Sergeant and served 22 years. On leaving the Army Alan worked both as a security driver and as a security guard, before his retirement in 2005, aged 65. Alan joined the Royal Hospital as an in-pensioner in September 2009. Entertaining the guests and in-pensioners at the ceremony was internationally acclaimed singer, pianist and songwriter Joe Stilgoe, who helped spread festive cheer with a medley of Christmas classics.